*Update* Please note that ChiChi-World are no longer a trading company. 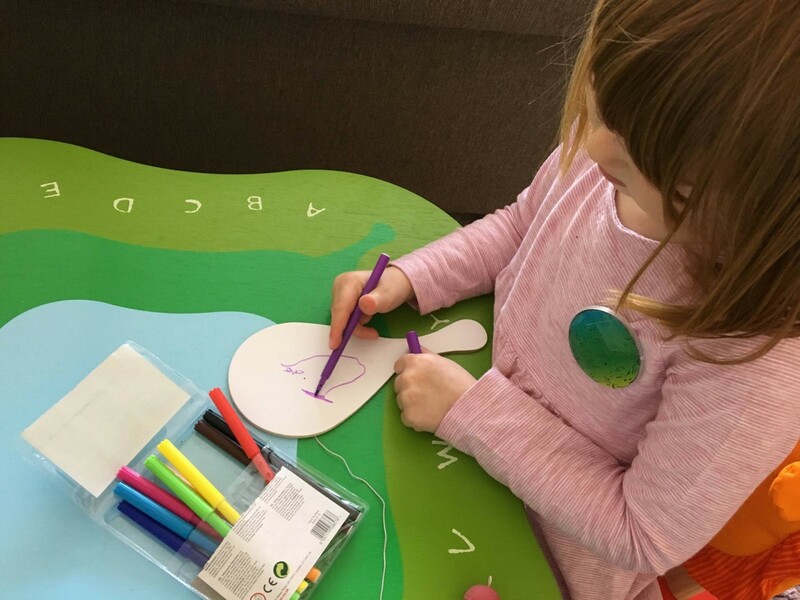 Alice loves crafting so when ChiChi-World got in touch about their Learn as you play Arts and Crafts box I knew she would enjoy them. 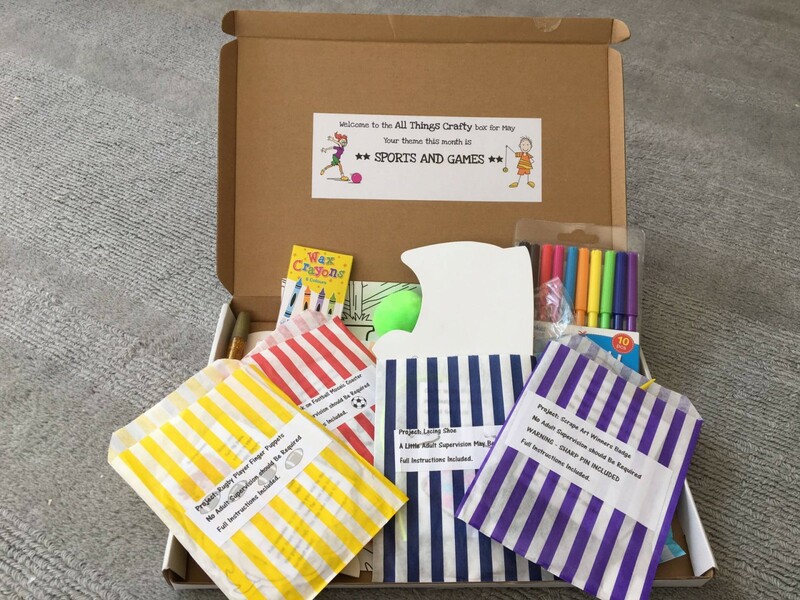 Learn as you play Arts and Crafts box are sent to your door each month, with a different theme every month. 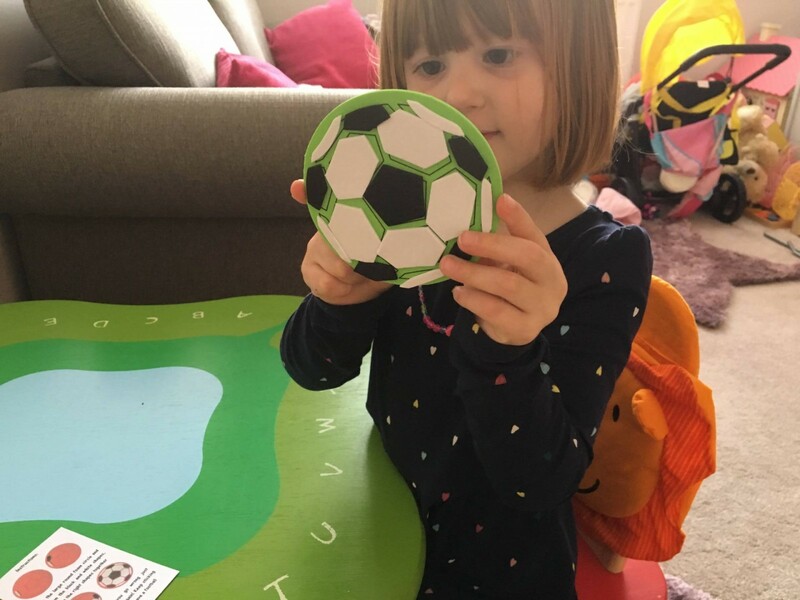 We were sent the All Things Crafty box for May and the theme was Sports and Games. The box arrived, it was a handy letterbox size, and it contained six different activities to do throughout the month. Each activity was in a cute little bag, labeled with how much adult supervision they would need. In the bag contained the instructions and all the bits you would need to complete it. In the overall box was a pack of felt tip pens, crayons and a glitter gel pen, all of which would last us much longer than completing these tasks. I always save our crafting for when Holly is having her nap after lunch. It means I can have dedicated time with Alice and do something that she loves. Alice couldn’t wait to get started. Our first task was Lacing a Shoe, to begin with Alice had to colour in the shoe in your own design. 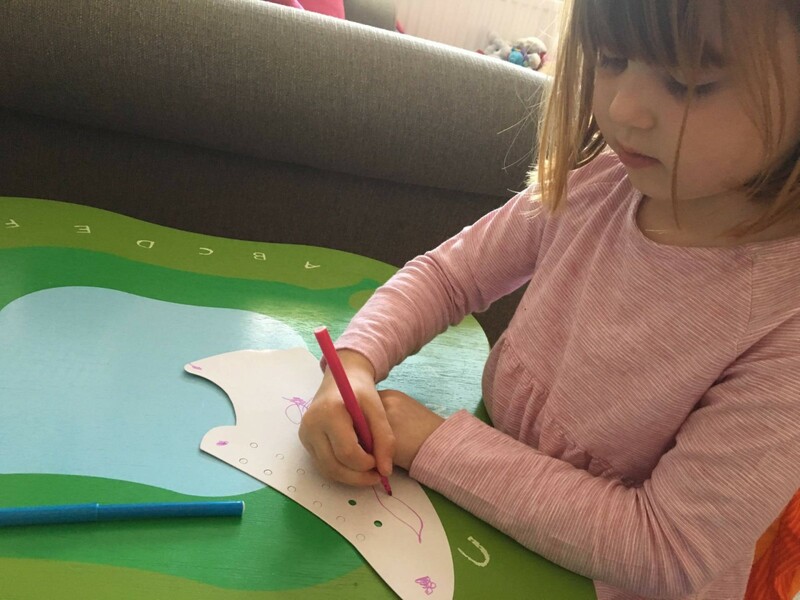 Well Alice is a little girl that likes to follow the rules, so when she saw the picture on the instructions she would only use the purple and blue felt tip pens. Once Alice had finished she had to lace up the shoe, I showed her once and then she managed to do the rest herself and was very proud of herself. The second task we did was making the Winners Badge. Alice had to scrape of the black side of the disc with the yellow scrapping tool provided. Alice thought that was great fun, mummy was there to pick up all the black bits! Once that was done she just had to clip the disc onto the badge and snap the clear plastic in place. She was able to it all on her own and wore her badge proudly. We then decided to save the other three tasks for another time. Alice must have enjoyed doing them, as it was her that asked to do them a couple of days later. The fourth task was a Stick on Football Mosaic Coaster. Alice really surprised me with this one, she did the entire thing on her own. 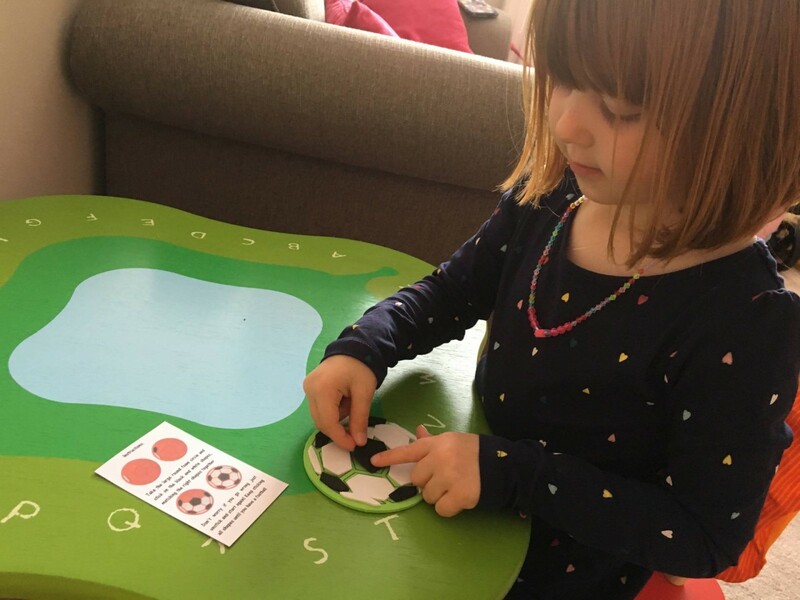 She knew to copy the design on the picture and she was able to take the backing of the pieces to stick down. To begin with she told me black was boring and she would just have white, but when she saw what she was creating she changed her mind. The fifth task was making a magnetic winners trophy for the fridge. 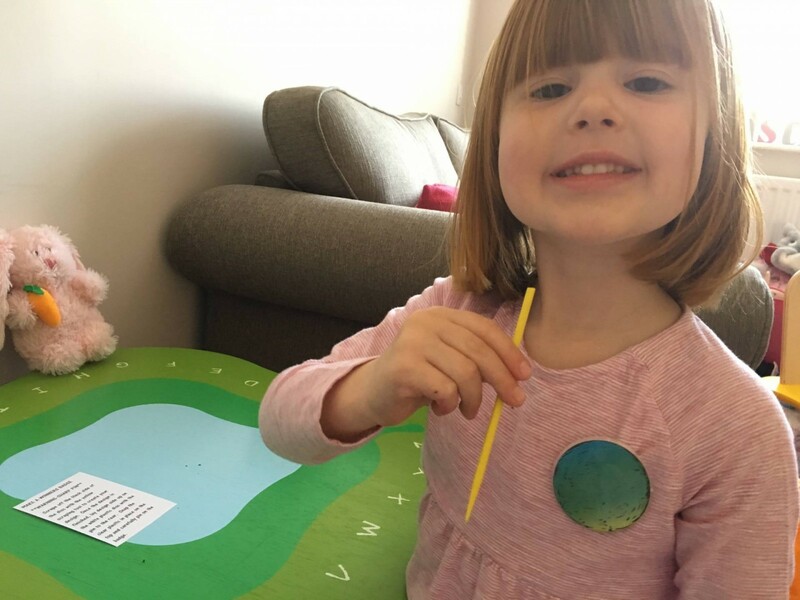 There were lots of stickers to use to decorate the trophy and Alice had to write her name too. We didn’t make it into a magnet, as our fridge isn’t magnetic. Instead Alice displayed it in her bedroom. The sixth task was Rugby Player Finger Puppets, Alice had to colour them in first. 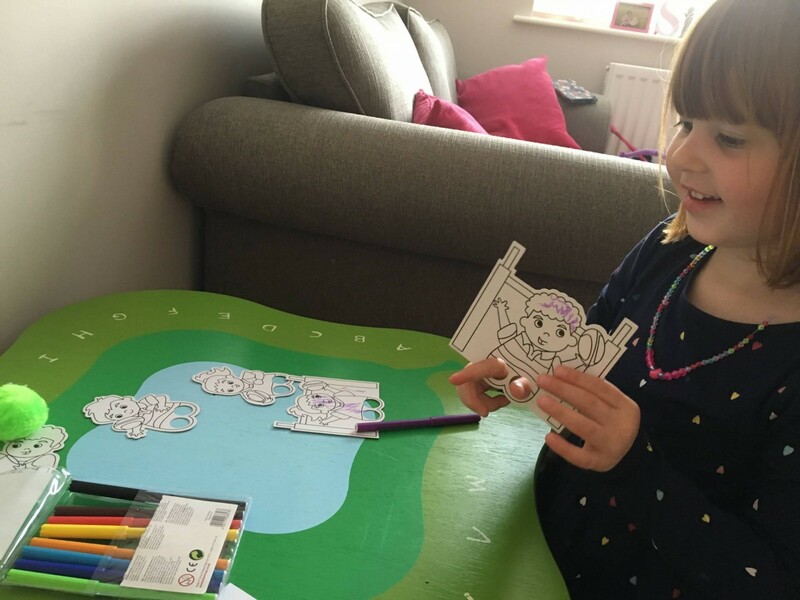 Alice has always loved colouring, but she would prefer to have a blank piece of paper than a colouring book. 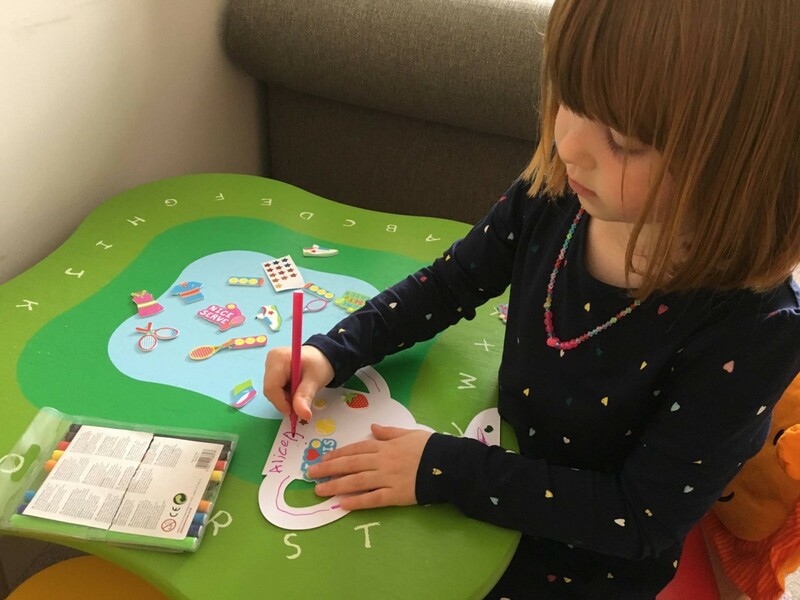 Recently I have been getting her to use a colouring book instead and showing her to keep in the lines. These were great for her to practice with. Once they were ready, she popped her fingers through the holes and with the green fluffy pom pom that was included for the ball, the game could begin. We really enjoyed doing the different activities over the week, it was nice to have them all ready to go as soon as Holly went to sleep. Because they are each in a separate bag, you could easier take out one bag at a time and spread them over the month. The best bit…there was no mess to clear up afterwards! ChiChi-World Crafty Boxes are a monthly subscription plan, you pay £7.99 per month, which includes P&P and everything you need. I didn’t use anything except what was in the box. You will receive a Crafty Box each month, no later than the 29th of each month. Each month has a different theme. There is no lengthy tie in, you can cancel whenever you need to. They are designed with preschoolers and Primary Key Stage 1 children in mind. Alice starts school In September and all these activities she was able to do with very little assistance from me. Disclosure: ChiChi-World sent us one Crafty Box for the purpose of this review, however all opinions are my own. It’s really good that you don’t need to use anything else and they really do send you everything you need! I love the way everything is packaged up in handy bags so you can just get on with the job I hand! Great for time-poor parents! Wow I am loving that crafty box. I can see it kept your little one very busy. I have never heard of this box before…What a fantastic idea! This is my first time hearing about the boxes but I love the concepts you have come up with and she has done a great job especially since she is only 3 years old! £7.99 is such a reasonable price for such a cute crafts box, I don’t have kids yet and if my nephew was a little older I would subscribe. This is actually a really good idea! It’s great to do activities with kids, but can be hard trying to think of them & get what you need together and then prep it. These ideas all sound simple, fun and appropriate for the age group, with some useful skills thrown in too. It’s so hard thinking of new activities to do but this keeps them going without you having to think too much. 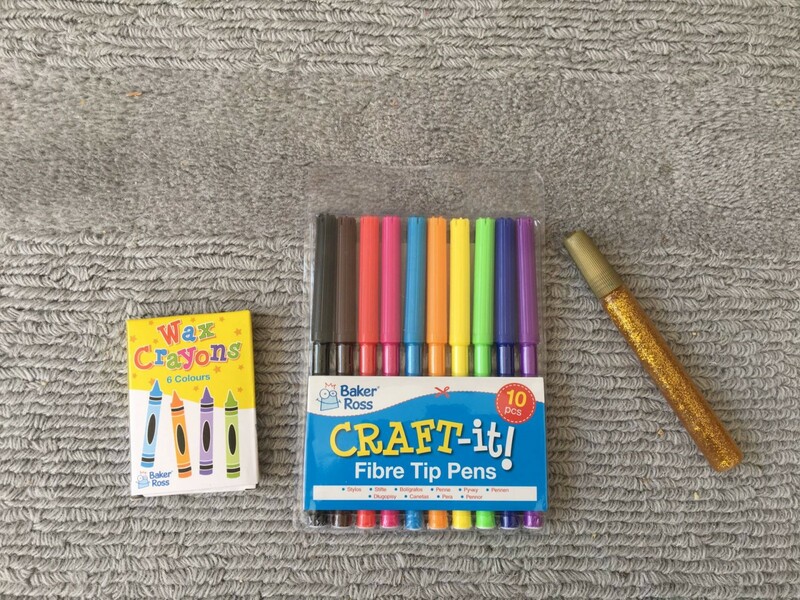 I love the look of these – I like the fact that everything is in there – as with other craft activities there is usually at least one thing I am missing!